Last week was World Innovation and Creativity day. In this spirit, APOPO is carrying out innovative research to investigate alternative ways that the mine detection rats can show us that they have found a landmine. The goal is to reduce ambiguity in the rats’ signals, which will make training and mine detection more efficient. The rats are clever creatures and we are training them to pull a ball fixed onto a collar when they find a target (such as the tea egg containing TNT pictured above). When the rat pulls the ball on the current prototype, a beep is sounded that clearly signals to the handler that the rat has found a target. Future prototypes of the collar might enable an LED to light up when the rat pulls the ball, or it could conceivably communicate a wireless signal to a handheld device carried by the trainer. In the future, this device could even be used for detection of other odor targets. Joy Milne visits the APOPO training center in Tanzania. “Joy Milne is better known as The woman who can smell Parkinson’s. In December, I saw Joy’s media appearances and learned about her collaboration with Edinburgh and Manchester Universities. At the 2018 People’s Postcode Lottery annual Charity Gala in Edinburgh, I met her and Dr Tilo Kunath. I took the opportunity to invite Joy to visit APOPO in Tanzania. There is currently no definitive test (such as a blood test) to make a diagnosis of Parkinson’s disease. Instead, a doctor takes a careful medical history and performs a thorough neurological examination, looking in particular for a combination of symptoms to be present. It remains an incredibly difficult disease to diagnose. Joy’s own husband contracted the disease but she only discovered she could smell it after she had joined a Parkinson’s charity and met other people suffering from the disease around whom existed the same musky smell. Joy had actually noticed this odor around her husband years before he was diagnosed. By chance she mentioned this observation to scientists at a talk and they were fascinated. Dr. Tilo Kunath, a Parkinson’s UK fellow at the MRC Centre for Regenerative Medicine, Edinburgh decided to test Joy’s sense of smell by using t-shirts which had been worn by six people with Parkinson’s and six without. She not only correctly identified the six positive samples but she pointed out that one of the control six had the smell as well. A few months later the t-shirt owner was diagnosed with Parkinson’s. Dr. Kunath then enlisted the help of Prof Perdita Barran, an expert in chemical analysis from the School of Chemistry Manchester University, to try to isolate the molecules that form the scent that Joy is able to smell. Prof. Perdita Barran and her team discovered that people with Parkinson’s seem to have different molecules in the scent bouquet, which it is what Joy is able to identify simply through smell. 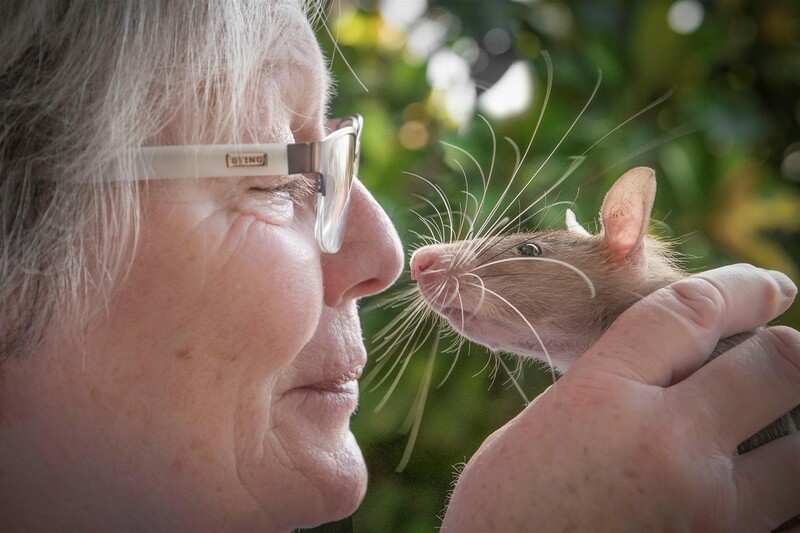 Joy had already heard about APOPO and she accepted my offer to visit our research and development headquarters in Tanzania, see the HeroRATs in action and meet our R&D and TB research team headed by Dr. Cindy Fast and Dr. Lena Fiebig. Joy spent a week with us learning about our scent detection work and kindly sharing her own experiences and knowledge. Unlike our rats, Joy can communicate directly with us and her observations were very interesting food for thought. For example Joy closely observed the rats sniffing behavior and made several recommendations related to their behavior and other conflicting scents in the working environment. We also learned a lot from her methodic approach using her analytical olfaction capacity in combination with a spectrometer to identify the volatiles of disease. Cette entrée a été publiée dans Culture, POPAUL le 25 avril 2018 par joel panciroli. Aug 12 Popaul Popaul has opened its eyes for the first time! Popaul has just opened its eyes! It is still living with its mother, and relies on her for milk and comfort, but is now strong enough to meet its trainer. Popaul’s trainer is spending a lot of time interacting with it and exposing it to many different sights, sounds, and smells. This process, called « socialization, » ensures that Popaul will not be startled when it is handled by humans or when it encounters something new. Socialization training, which starts as soon as baby rats open their eyes at the age of four weeks or so, will make Popaul easier to train and help meet the challenges that it will face later in its career. This week Popaul and its trainer took a car ride, played in the grass, listened to music, and met some new people. Though these are fun experiences for humans, for a young rat they can be frightening at first, but Popaul is quickly becoming comfortable. After about one week of socialization, Popaul will be ready to leave its mother, learn to be relaxed around the various stimuli present in the work environment, trust its trainers, and be more conducive to the remaining stages of the HeroRAT training process. Jul 15 Popaul Baby Popaul is born! Welcome to the world, Popaul! It is celebration time in APOPO’s rat kennels today for the birth of baby Popaul and its two siblings. Popaul belongs to the species Cricetomys gambianus, commonly known as the African giant pouched rat, which are often born in litters of 2 or 3. APOPO’s breeding program ensures that prospective parents of our future heroes are carefully handpicked to deliver healthy, happy and high-quality rat babies. A successful breeding program increases the likelihood of delivering excellent HeroRATs to detect landmines and tuberculosis. Cette entrée a été publiée dans POPAUL le 17 août 2016 par joel panciroli.